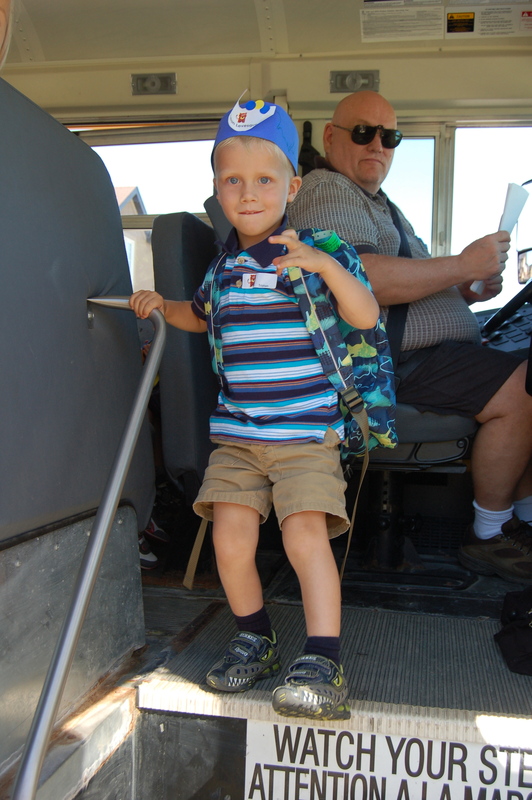 Seven days before he didn’t bawl getting on the bus. Seven days before I didn’t have to physically put him on the bus. Seven days before his emotions didn’t cause me to walk home with my own hot tears on my cheeks. And now? My little scholar? Grateful for kind friends and sensitive teachers who’ve helped make the transition easier for all of us! Day two of big boy school started off on a much lower note than day one. I drove Tristan to school again and as we approached the doors he clung to my leg and his little lip started to tremble. Tears began to well in his eyes. I put on my own bravest face, and pulled out my cheeriest voice. Again…. “You’re going to have soooo much fun at school!” and I assured him that I would be there waiting for him when he got off the bus. He reluctantly approached the teacher standing at the door and she immediately knelt down and wrapped him in her arms when she saw his tears. As I walked away I looked back to see his head still resting on her shoulder. Thank you for taking care of my sweet boy… and thank you also for consoling me by comforting him. And I knew that he would be alright… and that I would too. Before becoming a mama myself, I was on the other side of this scene. 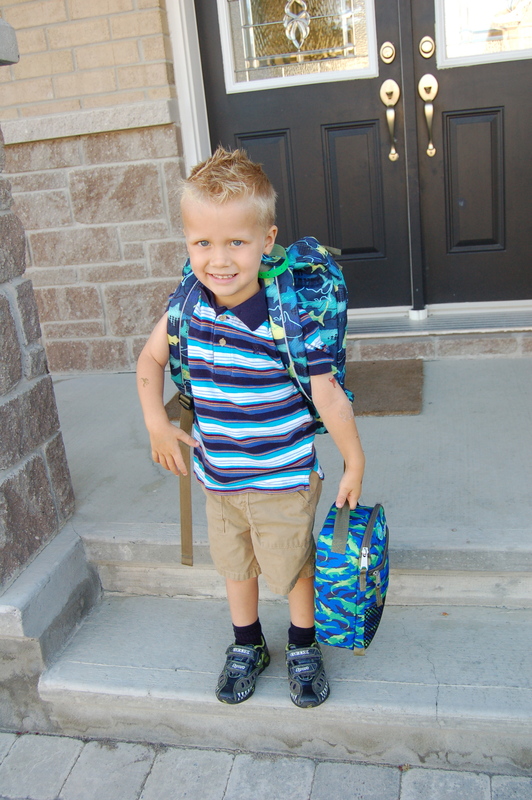 I stood at the doorway welcoming my nervous grade one’s into my classroom. I never realized how much trust those parents were putting in me. I loved my students like they were my own kids, but I never realized how important it was for the parents that it be that way. But now I know. Thank you to all the teachers of the world – for loving our children when we’re not there to do it ourselves. I set my alarm for 6:00, wanting everything to be ready for the first big day and not wanting to be rushed. I rose to a dark room. The darkness felt heavy, solemn. I cried in the shower. I cried blow drying my hair. I stood there staring in the mirror, internally asking myself some difficult questions. Have I done enough in the time he’s been home? Did we play enough? Read enough? Snuggle enough? 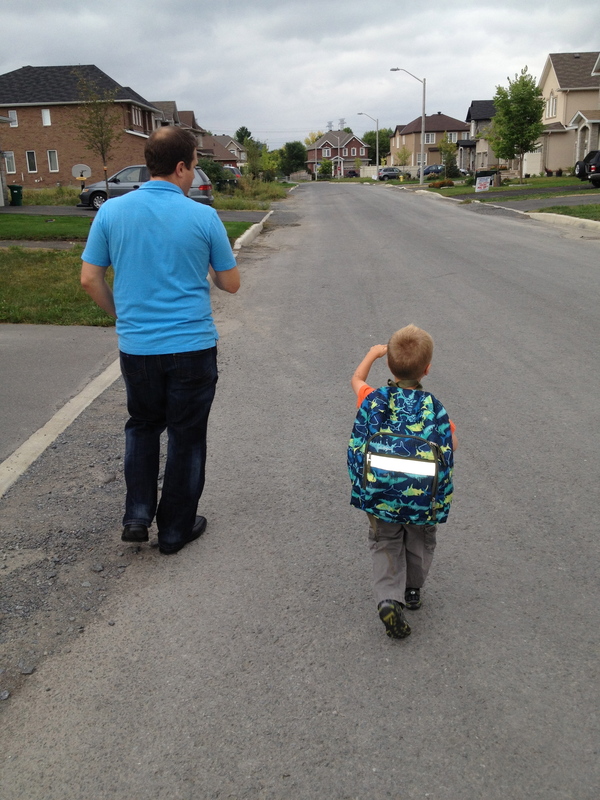 Have I prepared him well enough to go off to school on his own? Of course I know the answer is yes, but in the silent darkness of that first day, logic was nowhere to be found. Emotions ruled. We shared a special french toast breakfast and did the regular fanfare of first-day-of-school-pictures, where I had to use all my strength to hold it together. I continued to fight the tears on the short drive to school, stopping talking mid-sentence occasionally to avoid having Tristan hear the strain in my voice. And then we were there and his commencing of school happened somewhat like ripping off a bandaid. It all happened very quickly. We arrived and within minutes the doors were open and a nice teacher asked him his name and in he went. I knelt down to hug and kiss him, and wish him a wonderful day. 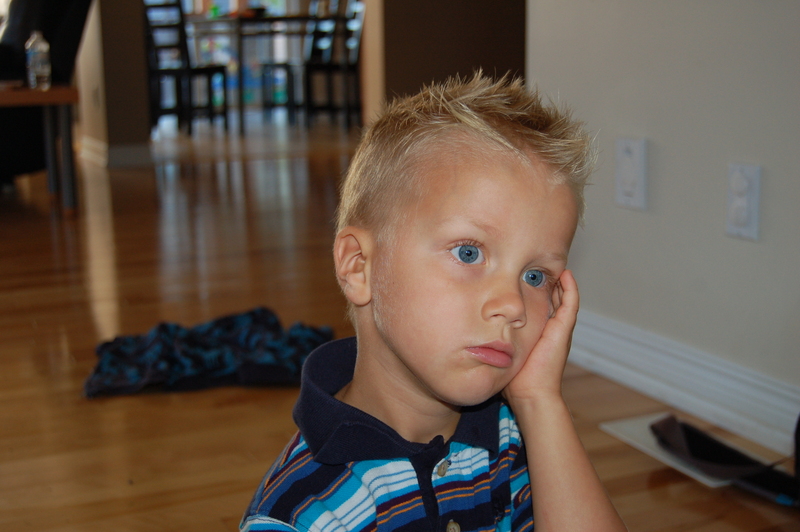 As he walked away into the school, he pressed his palm to his cheek. And that’s when I lost it. With Tristan’s eyes no longer on me, I managed to squeak out, “Luc! I need a hug!” before the sobs started and my shoulders began to shake. It was a short lasting cry but one that had been building and needed to get out. My little boy was off on a new adventure without me and I had to let him go. 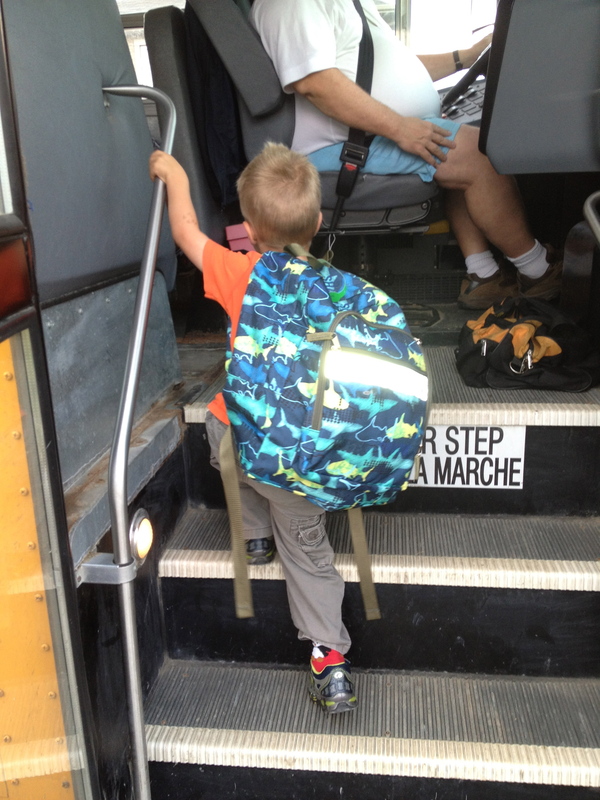 I picked him up from his first bus ride after school, and as he peeked around the first row of seats on his way to the steps, his eyes lit up when he saw his mama waiting for him. I clicked a quick picture and enveloped him in my arms. “…a little bit fun…” was his reply.